What Is a Thermostat Heat Anticipator? 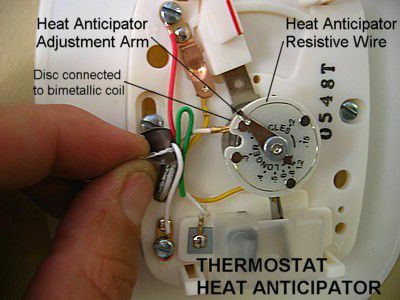 A heat anticipator is an electrical resistor device mounted in the center of many mechanical thermostats. It fine tunes the point at which the thermostat turns off the furnace burners. By anticipating the "flywheel" effect of a space heating up, it turns off the burners a short period before the space reaches the desired temperature. The heat anticipator essentially consists of a small disc attached to the bimetallic coil of the thermostat. The disc has a thin wire on its surface and an adjustment arm that touches the wire. The position of the arm determines the electrical resistance of the wire, affecting how hot the wire gets. As the wire heats up, it warms the bimetallic coil, which in turn shuts down the gas burners early as determined by the heat anticipator's setting. Make sure the thermostat is installed level. If it is not level, the mercury switch will not work properly. Locate the small disc with calibration marks at the center of the thermostat. It will probably have the word "longer" on it. It will also have a lever arm and indicator relating to the calibration marks. This is the heat anticipator adjustment lever arm. If the furnace is cycling on and off too frequently, move the heat anticipator adjustment lever closer to the "longer" setting by one calibration mark. If the furnace is exceeding or never reaching the desired set temperature, then move the adjustment lever away from the "longer" setting by one calibration mark. Once the appropriate adjustment is made, let the furnace run and the temperature stabilize for a period of two to three hours. If necessary, repeat the above procedure. If the problem persists and you cannot resolve the problem with these steps, you may need to replace the thermostat.